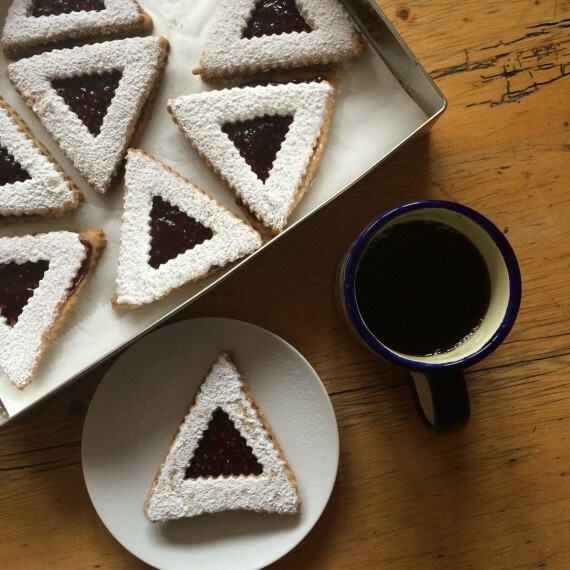 Purim 2015 (5775) – the year of the LinzerTashen! This year I thought outside of the triangle-shaped box. I forwent the ‘folded-up sides’ part of the traditional hamantashen, and made linzer cookies into linzertashen! 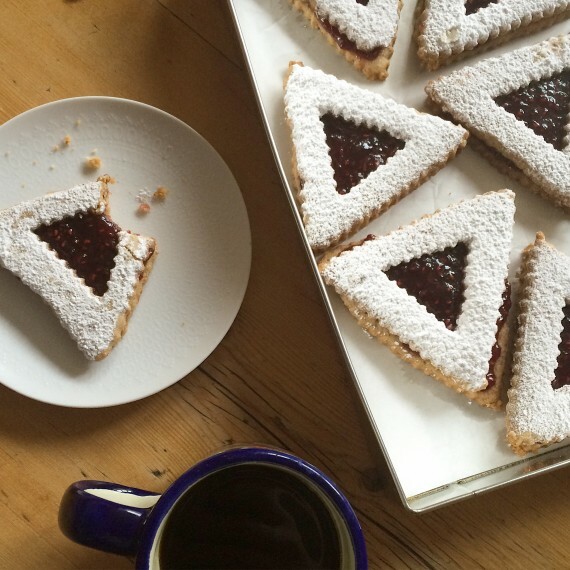 I started with a favorite Martha Stewart recipe for linzer tarts and went from there. 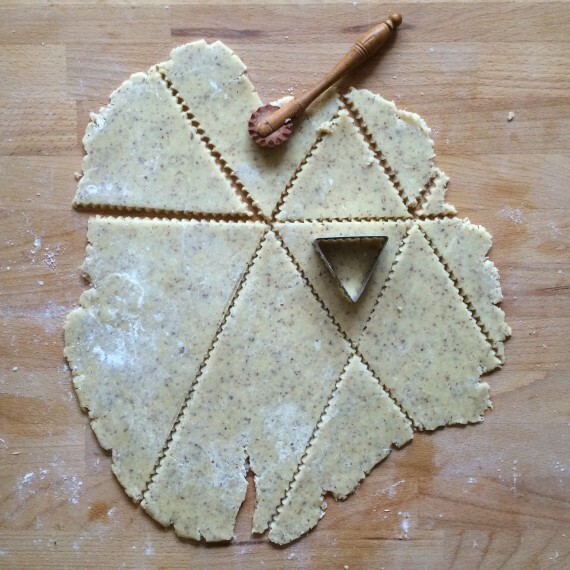 I didn’t have two sizes of a triangle cookie cutter, so I used my smaller cookie cutter as a guide and rolled a rolling pastry crimper/cutter to make the larger triangles. They did end up pretty large, but delicious – so more of a good thing, right? Happy Purim, y’all! Mix together flour, almonds, salt, baking powder in a large bowl. Cream together butter and sugar. When light and fluffy, add eggs and vanilla & almond extracts. When mixed, add the flour mixture to the butter and mix until blended and smooth. Turn out dough onto floured surface and shape into 2 flat discs, wrap in plastic, and put in the fridge for at least 30 minutes. Preheat oven to 325F/300F convection. Take out 1 disk 15 minutes before you’re ready to roll out the cookies so the dough softens slightly. Roll on a floured surface until 1/8 inch thick. Be sure to flip over periodically so the dough doesn’t stick. 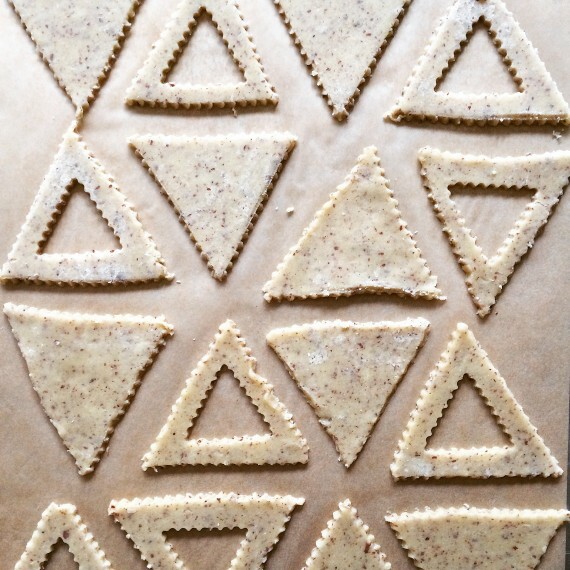 Using a 3″ triangle or a rolling cookie cutter, cut rolled dough into triangles. 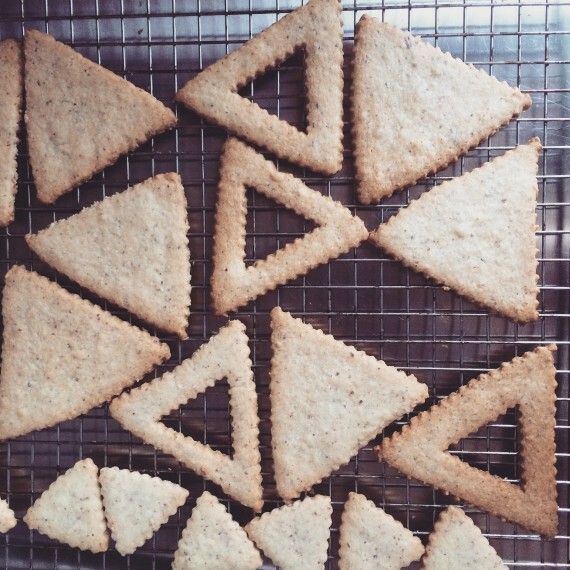 If you have a 2-inch triangle cookie cutter, use this as a guide – cut with 1/2 inch around the 2-inch cutter. Transfer cookies to a parchment-lined sheetpan with 1 inch between the cookies. Continue with the other disk of dough. Bake cookies for 12-15 minutes until lightly browned on the edges. Transfer to a cooling rack and allow to cool completely. (If making ahead, freeze at this step). Spread the closed cookies with raspberry jam, and gently top with sugared open cookies.